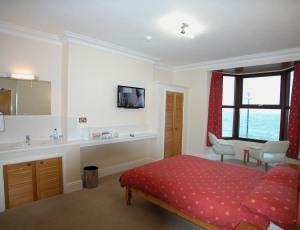 Most of our rooms have glorious panoramic sea views of Cardigan Bay. We have rooms with en-suite facilities and also standard rooms with shared facilities. All rooms have r/c colour TV, free wi-fi internet access, tea/coffee/hot chocolate making facilities, hairdryer, complimentary bottle of Welsh mineral water & chocolates. Comfortable guest lounge on ground floor with colour TV, DVD/VHS player and a stereo music system. Situated on south promenade between harbour and castle.